The books of HUMANE EXPOSURES PUBLISHING take a penetrating look at society's disenfranchised, questioning how long we can ignore the broken segments of our population, and at what cost. Visually and socially compelling, they call upon educators, leaders in criminal justice, and experts in sociology and psychology to join with the general public to increase awareness, address underlying social issues, and encourage essential parenting skills, setting new courses for social reform. Humane Exposures' books are available to the trade through Baker & Taylor, Greenleaf Books, and Quality Books. 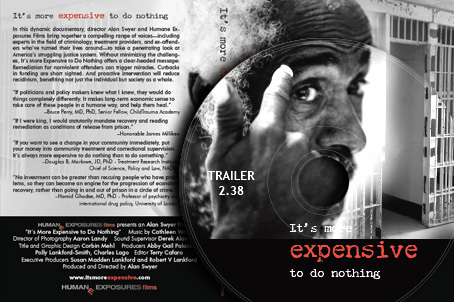 Individuals may purchase products at the Humane Exposures store and through Amazon, Barnes & Noble, and IndieBound. BORN, NOT RAISED explores the troubled psyches of youngsters serving time in juvenile hall. The book showcases a variety of creative tasks taken on by the young detainees—writing projects, artwork, elicited responses to photographs. The revealing results underscore Humane Exposures’ conviction that early education and youth development are the most effective strategies for breaking the cycle of at-risk behavior, and helping our youth thrive. 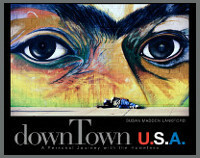 downTown U.S.A. explores the lives of the homeless in a major metropolitan city. Author and photographer Susan Madden Lankford kept a journal during her daily encounters with San Diego street people, observing how even the defeated, or seemingly so, share many of our hopes and dreams. The book, enhanced with Lankford’s powerful photographs, strives to turn public indifference to society’s most broken and vulnerable population into a humane awareness and response. 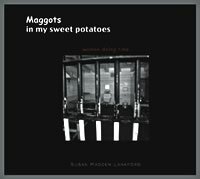 Maggots in My Sweet Potatoes: Women Doing Time by Susan Madden Lankford is the first in a photojournalistic series addressing crucial social issues. Through thought-provoking photographs and interviews, the author explores the kaleidoscope of alienation, personal despair, and fragile hopes of women caught up in the state's zeal for incarceration. "Lankford's leadership and work help us all to identify the emotional and psychological cycles that pass from generation to generation." "Informative, frank, relentless and disturbing, the book's strong voices and stark format are completely absorbing, raising important questions about why women end up in jail and, too often, keep coming back." "What we are as adults is the product of the world we experienced as children. The way a society functions is a reflection of the childrearing practices of that society. Today, we reap what we have sown." "A compassionate call to action... Lankford argues that most inmates [of juvenile hall] can transform their traumatic histories into productive maturity if sustained by just one 'good enough' adult." "More policy-oriented than academic in tone, this book is recommended for specialized juvenile justice collections and libraries holding the other two volumes in the series. Though government austerity is in vogue, this book is a powerful reminder of the social costs of neglecting the specific needs of at-risk youth." "Susan's Lankford's BORN, NOT RAISED spotlights the raw stories of children traumatized by neglect, abuse, and poverty. Working with outside professionals, Lankford exposes an overburdened juvenile justice system while offering powerful tools for change." 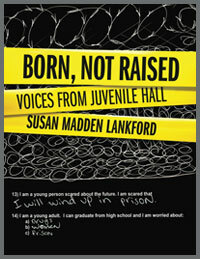 "Susan Lankford captures the heart and soul, aspirations, hopes and fears, of kids in the juvenile justice system. If only juvenile judges could have access to the writings, photographs and stories of the kids she's met, juvenile court would be much more rehabilitative." "Every single adult complication can be directly traced back to a childhood trauma. BORN, NOT RAISED takes the reader on a dark path that shines just enough light to hopefully alter the direction of our youth." – Jennifer Storm, Author of Blackout Girl and Leave the Light On.